This may sound alarmist, but I believe it is true, if not right now we are certainly heading that way and will arrive there very soon. We are a large Scout Group with several sections covering all age groups (6 to 18) but we cannot recruit any adult volunteers to maintain these sections. We have already closed a Beaver Colony due to a lack of leaders, one of the remaining 2 Colonies is now also at risk. Both of the Scout Troops are running right on the margin this puts a tremendous strain on the leaders that are in the sections. Despite repeated efforts to recruit more volunteers we get nowhere. I understand not everyone wants to volunteer, and that many think they don't have the time to do it, but there are no other options - either people volunteer or the sections (and maybe the whole Group) close. The only sources of adult volunteers available to us are the parents/family of existing/potential members and the wider local community. Don't sit back and think that someone else will do it and it will all be OK - recent experience tells us that if YOU don't volunteer nor will anyone else and we close down. No volunteers no Scouting, it's that simple. Look at the Recruitment Page for more information and get in touch - we can't do it without you. A 17 seat minibus (and trailer) available for hire by Scouts, Guides & other charity, voluntary & community groups. 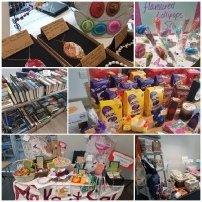 Our recent table top sale was fairly successful, we could have done with a few more visitors, but we raised nearly £300.